Every hit a bang board? Sounds like a terrain park feature you bonk with your skis or board, right? But no, the original bang board was a solid oak plank located at the top of Gunstock Mountain’s 1935 rope tow. The rope tow slipped through a drilled hole in a wooden board just prior to the bullwheel. If skiers had not let go of the fast moving rope in time, or their gloves or coats got caught, they would bang into the board. How’s that for an aptly named, primitive but effective safety device? Skiing was a hearty sport back in the day at Gunstock, according to Carol Lee Anderson, author of “The History of Gunstock.” But you did not have to pay for your lift ticket unless you survived the rope tow. Tickets could only be purchased at the top of the tow, so if any injury occurred on the way up, liability was not an in issue. Already skiing had earned the reputation as a risky sport, put into the same insurance liability category as a roller coaster according to Anderson. “Gunstock’s Ski Hoist,” the original rope tow, was the country’s second following Suicide Six’s rope tow in Woodstock, Vermont. 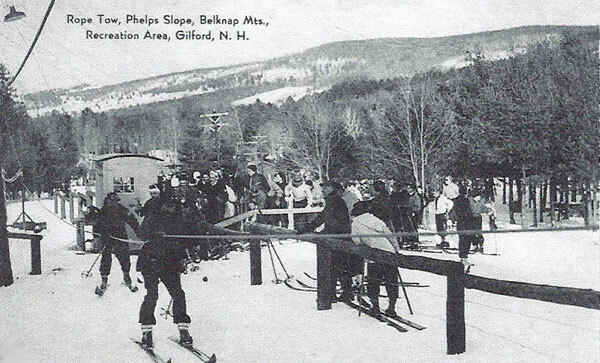 Located on Gunstock’s west side, the rope tow was made of 6,2000 feet of rope that traveled at 30 mph, carrying only four skiers at a time, according to Anderson. Talk about earning your turns when and if you reached the top, and did not smack the bang board. Even a successful tow ride tended to shred the crude leather ski gloves or woolen mittens if your grip wasn’t super secure. Skiing at Gunstock has come a long way since the first single chair in the East in 1938, a single chair built by Maine-based Hussey Manufacturing, which was the second in the country to Sun Valley, Idaho. Gunstock celebrated 75 years in 2013. Today skiers ride Gunstock’s Panorama high speed quad to the scenic summit, you can even ride Gunstock’s Zipline down the entire mountain in three speedy sections. The downside, nowadays you have to pay before you ride. “The History of Gunstock” is a great read, full of anecdotes of Gunstock’s evolution, quoting legendary locals including Olympian Penny Pitou and Torger Tokle – the Norwegian ski jumper. Tokle is revered for his long-standing record of soaring over 250-feet off Gunstock’s Nordic jump in 1941. This month marks the 75th anniversary of Gunstock’s 70-meter, dedicated as the Torger Tokle Memorial Ski Jump. Gunstock Mountain’s Historic Preservation Society is currently restoring all four Nordic ski jumps, the 10, 20, 40 and 70-meter. Today’s park skiers are pushing the sport by going bigger and better than their predecessors, but it’s worth looking back at our alpine ancestors and their ski survival skills and ingenuity that brought us the sport we continue to loved today. Gunstock has been a trend setter in skiing from first lifts and ski jumps to today’s Big Air Bag and the longest Zip line tour in the Continental US. Thankfully, there is no wooden bang board at the base of Gunstock’s zip line, just lots of springy rubber stoppers.